Nelson Irrigation is offering an improved low pressure "up-top" mounting for center pivot water application packages. The new Navy Plate for the A3000 Accelerator is designed for up-top mounting and offers a wider wetted pattern than sprayheads, resulting in better overlap and longer soak time to reduce runoff. 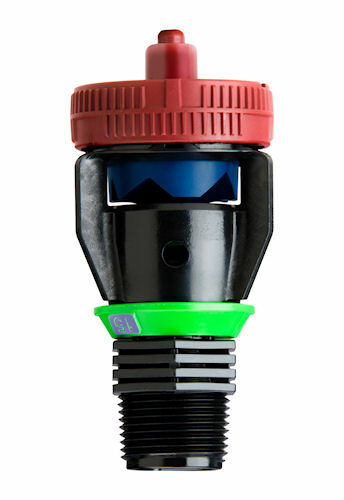 Top-mount low-pressure pop-up sprinkler nozzle from Nelson operates at 10 psi and provides wider wetter pattern. Compared to impact sprinklers, the A3000 Navy Plate operates at lower pressures — 10 psi — saving energy. Expect long wear life because unlike impact sprinklers where the seals and bearing are exposed to water quality and pressure, the A3000's seals and thrust bearing are protected. Re-nozzling to match crop requirements or pumping capacity is fast and easy, as the A3000 Accelerator features a quick-change, color-coded plastic nozzle. The new Navy Plate for the A3000 operates through a full nozzle range without having to change sprinkler models. For more information contact info@nelsonirrigation.com , or call (509) 525 7660.